Soul So Good Healthy | Thy Food Shall Be Thy Medicine. THY FOOD SHALL BE THY MEDICINE. Teaching healthy eating habits for life. Did you know that healthy eating habits lead to more than physical wellbeing, they can also have a positive impact on your mental self as well? Spreading this word is our mission at Soul So Good Healthy a 501c(3) non-profit founded in 2010 and dedicated to health education and awareness throughout the Washington Metropolitan Area. We have a special focus on healthy diet education and provide programs centered around healthy eating to individuals and families. We believe that there is a community-wide crisis and we are stepping up our efforts by working with elected officials, civic leaders, faith-based organizations, community centers, and employers to spread the word. Soul So Good Healthy was founded by Diane Collins, Holistic Practitioner Health Advocate, owner of Collins Wellness Center and author of the Soul So Good Healthy Cookbook. Scroll through our photos below or click on an image to enlarge it and view as a slideshow. Soul So Good Healthy is dedicated to promoting good eating within our community. We’ve partnered with the National Diabetes Prevention Program and the Black Women’s Health Imperative. You can prevent or delay type 2 diabetes! Sign up for the program today and change for life using the form below. Meet Our National Diabetes Prevention Program Participants! Helen is a success story of the National Diabetes Prevention Program. She was able to recognize areas where she needed to change, make the necessary changes with the help of the program, and regain control of her health! She has continued her success through using the knowledge the program has equipped her with. Demetrius was apart of our all Men’s group. At such a young age, he knew he needed to make a change for the better for his health. He joined the program in hopes that this would kickstart his journey. Demetrius was determined to make the CYL2 classes work for him. Using the principles of healthy eating and exercise he has continued to drop the pounds and reduce his risk. Demetrius lost over 50 pounds while in the program! He has continued to excel and has now lost over 100 pounds and the numbers are continuing to drop! Anthony is a small business owner who often felt sluggish and very fatigued while working day to day. At 5’9 and 260 pounds, he was tired of feeling much older than he is. He was exited to learn about the Change Your Lifestyle, Change Your Life (CYL2) diabetes prevention program. “I felt I had a community working with me.” Anthony started to change his diet, incorporating whole foods, watching his portions and serving sizes. After a few healthy cooking demonstrations, Anthony incorporated those ideas into his routine. He has lost 39 pounds an still going strong! Aronese has lost 18 pounds and is eating healthier and implementing more physical activity. Over the past 16 weeks, she’s learned the importance of NOT skipping meals. She says, life can be hectic and oftentimes I become so busy, that at the end of the day I realize that I haven’t eaten. Of course by then I am really hungry and looking for anything to put in my mouth including fast food. Not skipping meals keeps me full and healthy. Since I’ve decided beforehand not to skip a meal, I prepare my food and choose my healthy snacks. It’s a healthier choice. Since I’m not getting really hungry, I can wait to get home and eat whole foods and fresh fruits. Clearly this program has changed the way I think about food. Before my thoughts were “well that’s good for me” but now my thoughts are “yeah, it’s good for me but how much fat is in it?” I’ve learned to budget my daily fat intake. Limiting fat intake controls my weight as well as how I feel. Another benefit of the program is that it encouraged me to increase my physical activity. My thoughts about “exercise” was another obstacle to overcome. But now I know that I have to be intentional and also plan for time to exercise. It’s like anything we plan to do, it gets done. Exercise is the habit and the habit is a good one. What I’ve learned in this program is “I CAN DO IT”. When Art started with the program he weighed about 257 pounds and had an A1C of 6.4. At the end of the program he weighed 217 and plans to lose more. His mother currently has type 2 diabetes and his father also had it before he passed. As a result, his mother encouraged him to enroll in the class but she was concerned about Art actually completing it. He says, based on what I learned in the classes, I changed my diet from fried oyster po’boy sandwiches and all kinds of fried foods to much healthier choices. I bought a Magic Bullet and now I love to make vegetable and fruit smoothies. I make 1 or 2 healthy smoothies every day and I watch what I eat and how much. I also started taking a photo of every meal so I would remember what to put on my food tracker andalso see where I needed to make more changes. Gradually I began to change from high fat high calorie foods to more healthy choices. I attended the classes faithfully and I want to be an example to my family by taking care of myself. I look for nutrient rich foods and I can really tell the difference when I don’t have time to prepare my smoothies or when I go off of my program. I always feel much better when I get back on track. Because of a bad knee injury, I had a very serious challenge initially when it comes to exercise but going to physical therapy helped me increase my physical activity. Like many others, financial challenges also made it difficult at the beginning to make healthy food choices but he was able to find a way to make that work as well. It really is about making good choices not only about what you eat but what you spend your money on. When Monk joined our all men’s group he weighed in at 324 pounds. It was clear to his Coach that he was committed from the very beginning and serious about making some major changes. Monk was excited to get the information shared, not only from the Coach, but from the other participants as well. He began immediately changing his eating habits, taking advantage of everything he was learning. He also began working out, increasing his physical activity every week. Once he started losing weight, his family and friends began noticing and complimenting him, which encouraged him even more to make the changes he needed and wanted to make. As a result of his hard work and participation in the program, Monk has lost 49 pounds. Soul So Good Healthy was born out of a desire to help educate and empower those with health disparities, particularly amongst minorities within our own community. We provide the knowledge and tools necessary to combat and overcome health challenges. We realize that a common thread found in most health ailments seen in our community is a poor diet, and that people who desire to eat healthy lack a foundation in good food. Healthy food CAN taste good, and be nutritious at the same time! 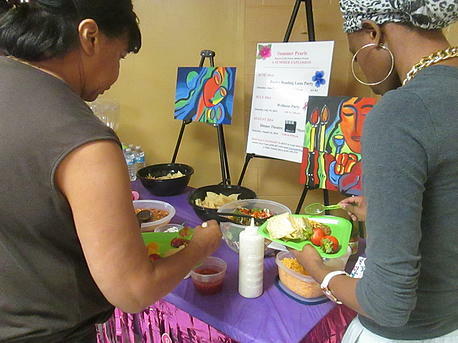 Our Soul So Good Healthy program utilizes rich flavors, vibrant seasonings, captivating textures, and fresh ingredients to invite people to engage a healthier lifestyle. After several years of encountering people at church and other local groups, our founder, Diane Collins saw a need to reach more people with the healthy lifestyle message. Soul So Good Healthy was established as a 501c(3) non-profit in 2010 as a means to reach these people. Diane Collins has spent most of her life experimenting with different diets, foods, and cleanses. Through education, she learned that changing basic eating habits, incorporating whole food nutrients, nutritional therapy and physical activity was the only way to sustain lasting weight lost and ultimate health. It’s what led her to found Collins Wellness Center and write her book, Soul So Good Healthy Cookbook. Diane Collins’ extensive knowledge in the holistic medicine field stems from her education. She attended the Institute of Integrated Nutrition in New York, receiving certification as a Holistic Health Coach. She then trained at a whole food culinary school in New York before achieving her bachelor degree in Nutrition and board certification of Doctorate of Naturopathy. She is also a Trained Lifestyle Coach and Recognized CDC Diabetes Prevention Provider. The idea for Dr. Collins’s Soul So Good Healthy Cookbook stemmed from comments she regularly heard while studying holistic modalities. Comments such as, “healthy food does not taste good,” or, “healthy food is hard to cook,” inspired Dr. Collins. She has dispelled these myths by creating high-quality vegetarian entrees that compliment a healthy lifestyle. Registration for classes is necessary: call Dr. Collins at 301.735.6747 or signup using form at the top of the page. Contact Soul So Good Healthy! Soul So Good Healthy, Inc.